The Deputy President of the Nigerian Senate and former Speaker of the Parliament of the Economic Community of West African States, ECOWAS Parliament, Senator Ike Ekweremadu, has warned against any military action by ECOWAS in Gambia. He said it could plunge the country into bloodletting and threaten the security and peace of the entire sub-region. Ekweremadu, who regretted that West Africa had witnessed so many bloodbaths, including armed conflicts and human sufferings engendered by insurgency and terrorism, urged the ECOWAS Authority of Heads of State and Government and the international community to explore dialogue, while also allowing Gambian laws to take preeminence as a sovereign nation. The immediate past Speaker of the Community Parliament, canvassed sanctions in line with the traditions and relevant Protocols of ECOWAS, rather than any form of military actions, should dialogue and judicial options fail. He said: “From Liberia to Sierra Leone, Cote D’Ivoire, among others, West Africa has seen so much bloodletting and political instability. Heavy destruction of lives and property has also been visited on the sub-region by insurgency and terrorism, which remain present danger to the peace and security of West Africa. “Instructively, what normally started like child’s play often resulted in protracted, but avoidable political upheavals and fratricidal wars. This is why the people of West Africa, especially the ECOWAS Authority of Heads of State and Government, must tread with utmost caution to ensure that the sub-region is not plunged into yet another needless bloodletting and humanitarian crisis over the Gambian political challenge. “Importantly, we must all acknowledge the fact that Gambia is a sovereign state. If her Constitution and electoral laws allow for judicial role in resolving electoral disputes, then the Gambian constitutional courts must be allowed to count in resolving the political impasse. “It could also amount to setting a bad and crisis-triggering precedence if the Gambian laws are preempted and her sovereignty breached. The sub-region must uphold the rule of law for the sake of the peace, stability, and prosperity of Gambia. We must take all necessary steps as a sub-region to steer the West African nation and indeed the entire Community away from any looming bloodshed and monumental destruction”. 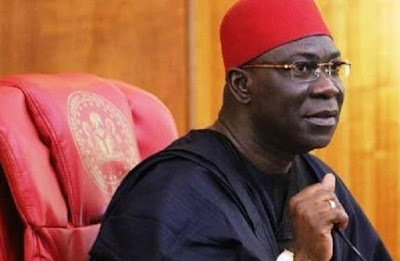 Ekweremadu, however, commended ECOWAS Heads of State and Government for their concern and commitment to resolving the political situation in Gambia. “I am aware that several high level meetings have been held and several missions undertaken to the Gambia as a way of finding solution to the problem. Importantly, our President, President Muhammadu Buhari, is now charged with the responsibility of driving the efforts and I wish him sufficient wisdom to address and resolve the political situation without any resort to military option”, he added. Ekweremadu also charged the Gambian authorities to ensure the protection of the fundamental and political rights of the Gambians and the opposition to avoid escalation of the political crisis.